Do you like my new bag? ‘It’s white!’ I hear you cry. I would never buy a white bag but making one that I know I can wash is another matter. Anyway I needed a nice roomy packable bag to take me to lunch whilst on honeymoon. And if you can’t be flippant on honeymoon, when can you be? it is done for you. This makes the fabric incredibly stable. 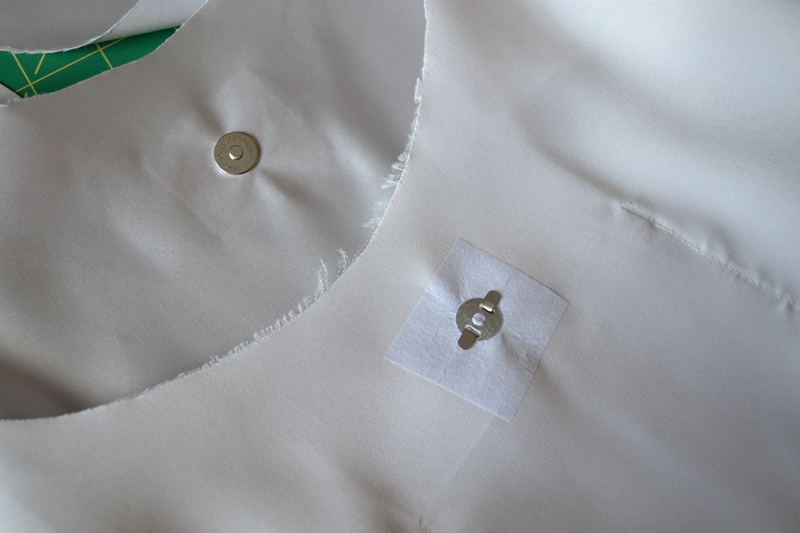 As easy as sewing cotton. This fabric would make an incredibly cute 60’s shift dress. I might just have time to fit one in the 8 week count down to our trip. 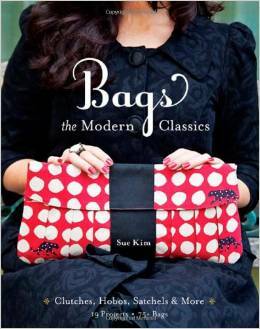 The pattern for the bag came from this book. Don’t be surprised if you see a few more makes from this book! I plan on making the front cover clutch bag next. This one was incredibly simple. And the whole lot sewn together, right sides to right sides. 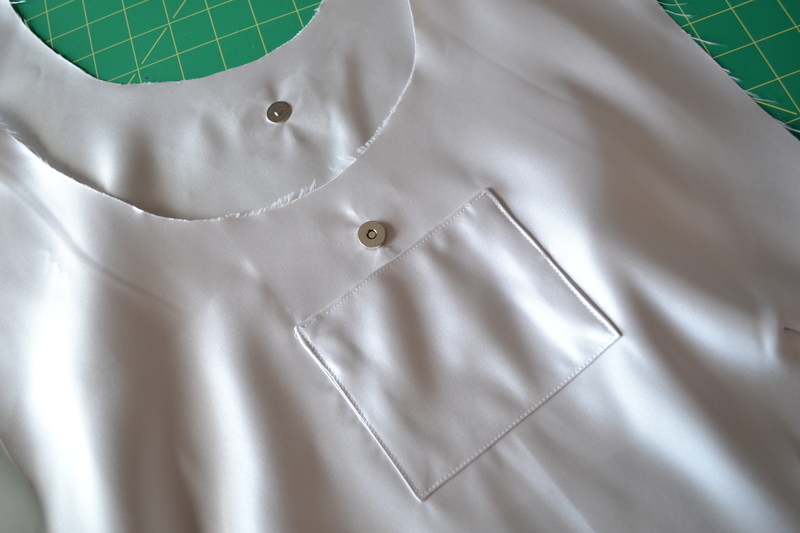 The outer fabric turned the right way around and inserted into the lining and joined together along the top curve. Then turned and top stitched. I can really see this bag in an Orla Kelly fabric which would be perfect for an upcoming friend’s birthday. Meanwhile, I’ll just have to pack mine away. Somewhere it won’t get dirty! Your 10 weeks will whiz by! A very glamorous bag, where are you going, if I might be so bold. Thailand!!! I’ve only ever been as far as Cyprus so a HUGE adventure for us! Seems that every bag you make is gorgeous and so is your new white one. I wouldn’t mind a white bag as long I can put it in the washingmachine if necessary. And I just read you are going to Thailand, that must be a great journey! I can’t quite believe we are going! Thailand, wow! 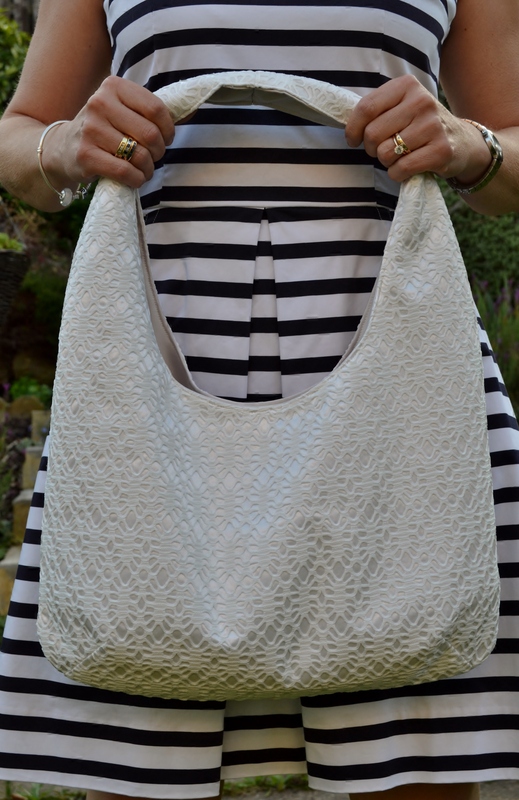 We went to Bali last year for our honeymoon, but I didn’t have such a glamorous bag:) It looks very stylish considering it seems pretty simple to make – might have a go at making my own version having seen yours. Really easy to make. You could so roll these out. 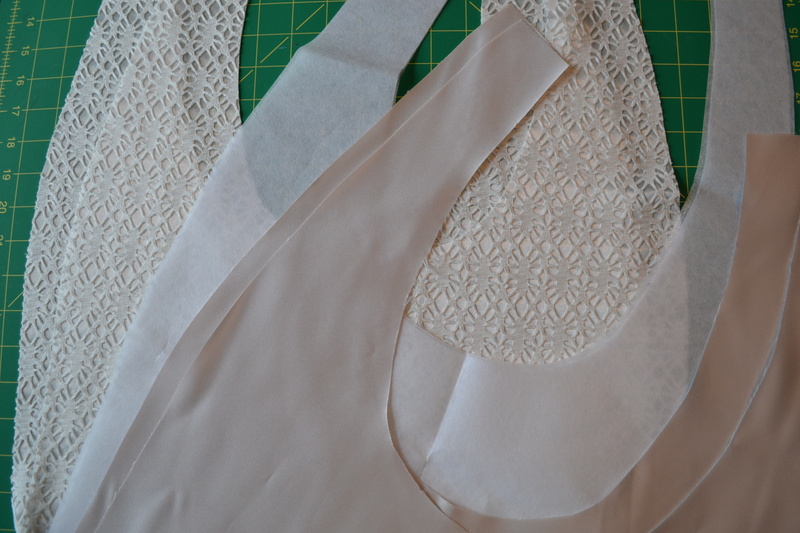 The correct interfacing is the key. 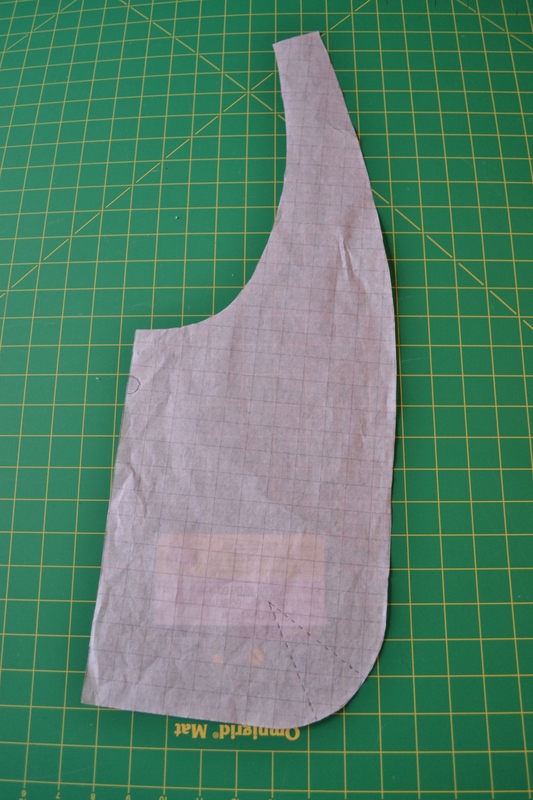 I used an extra ‘sew in’ interfacing, in addition to what was recommended. This is lovely Lucie. I’ve been intrigued by that bonded lace, now I have a much better idea what it’s actually like. There is so much you could do with that fabric! I would say it was great for tailored stuff with a bit of body. That’s the beauty of the WTF blog as some of their fabric leaves you quite stumped! I was going to ask if you’d made the lovely stripey one but I see you’ve said it was from Gap. Seriously though, I think you are right about the shift dress. There was one in the Boden catalogue a couple of seasons ago that I really liked and wanted to copy but didn’t fancy faffing about with lining lace so thanks for the tip about the bonded stuff. Where on earth I will ever wear it I have no idea – especially if I made it in white – but then I’m not going on honeymoon again any time soon. They do a beige version and also a black. The black would also make a ‘lovely 60s shift dress’. Those that know me know I’m quite a fan of Boden. Especially the Boden sales from which I might have just been purchasing the odd stylish sightseeing dress! i absolutely love your bag – you are so clever! Fabby holiday bag. Surely you won’t have to pack lunch as new hubby will be treating you to 5 star dining at every opportunity 😉😉 – what am I saying, mine doesn’t!! However it will fit a ball of yarn and a crochet hook in! When we were in Malta I nearly fell over one morning when he said ‘Shall I pack your knitting in my backpack in case we stop somewhere?’ That’s 8 years of training! Hilarious! I have a long way to go until I mould my man into such a keeper! I thought to make it big enough for a little yarn! I just need to work out what project I take on a 12 hour plane journey. I have this book!! Now I’ll have to try this pattern too. Lovely bag!! Have you tried any of the other patterns? I’ve done the Elva bag on page 122. I think the next time I make it I’ll lengthen and widen the closure a little bit, but overall I liked the pattern. Just nipped over to your blog and loved it! You have a great upbeat style about your writing. All shucks, you make me blush! Thanks so much!